All transactions are safe and secure with a reliable history in online purchasing behind each of our associates. Buy the Michael and Laurie t-shirt to own Halloween clothing and merchandise. The Halloween tee above displays a Calvin and Hobbes parody. Michael Myers is chasing Laurie with a knife. They're not exactly two buddies. This funny Halloween Michael Myers t-shirt celebrates the legendary killer's weapon of choice, a kitchen knife. Michael indeed finds other creative ways to kill as well, including stabbing (not shooting) a victim with the barrel of a shotgun. This tee is perfect for horror fans and comic fans alike. Match it with a Halloween movie hat. 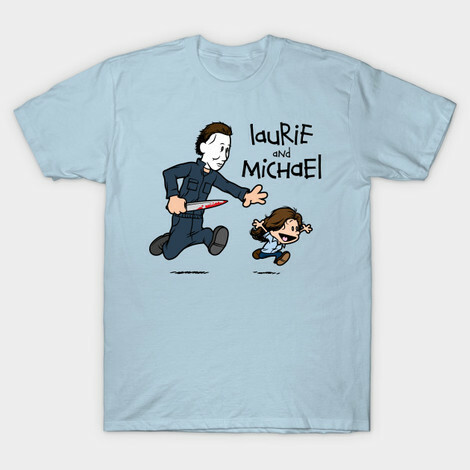 In addition to the Michael and Laurie tee above, browse the Halloween Clothing Gallery for more apparel like men's and women's clothes, kids shirts or hoodies.